In Part 2 of my year-end favorites, I wanted to more specifically highlight some of the terrific art teams I enjoyed. There are so many great artists working today, there are many others that I could have included. Part 1 is available here. 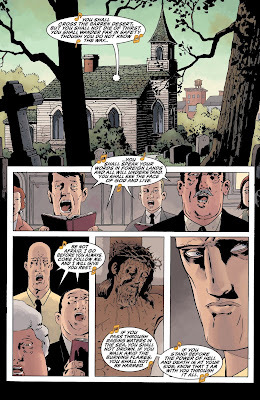 Black Hammer - Dean Ormston & Dave Stewart - If you're reading Black Hammer, you know how good Dean Ormston's artwork is in that book. He's incredibly versatile in portraying the sad, lonely world in which these weird, castoff, former superheroes live. 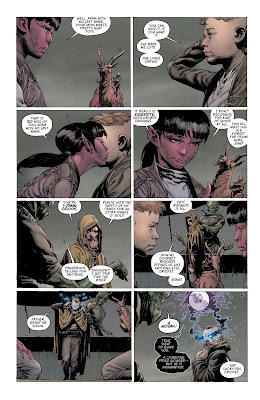 The characters here are beautifully ugly (in a way sort of like Frank Quitely, but Ormston has his own, exaggerated, elongated style) and the town setting is a little spare, a little rundown, and is beautifully contrasted by flashbacks to the world of magic and superheroes and adventures that these characters used to inhabit. Part of what makes that contrast so effective is the color work of the master, Dave Stewart. I always have an appreciation for non-obvious choices, and I feel like the obvious choice here would have been to make the present dark and gray, and the past light and shiny. But Stewart doesn't do that, instead (as shown in the present day image on the left and the past image on the right) he just makes the past slightly more vibrant, and Ormston's line is just the slightest bit cleaner. It's wonderful, effective, subtle work. 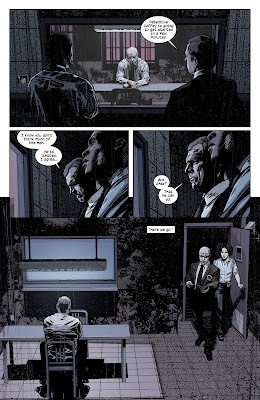 The Black Monday Murders - Tomm Coker & Michael Garland - Tomm Coker's artwork in The Black Monday Murders has been a real revelation for me. Coker has a great line, and I'm a huge fan of the way he creates his characters. The characters feel realistic as far as facial expression and body type. Coker's character depiction reminds me of that of Leinil Yu (for the strong, muscular line that's conveyed in characters' faces and emotions), Tula Lotay (for the wry expressions and the striking beauty of several of the characters) and Michael Lark (for the painstaking, detailed work done in world building, along with the careful facial acting) but Coker's style feels very much like his own. His body language and facial acting all feel very precise and on point for the particular mood or reaction that needs to be conveyed. 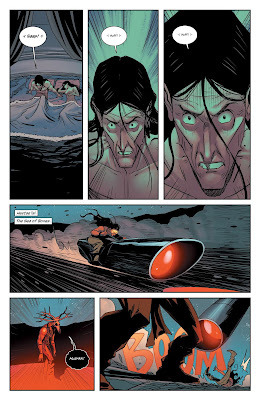 What helps Coker sell this grounded world tremendously is the color work of Michael Garland. 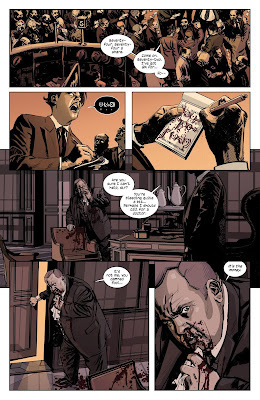 I'm a huge fan of the not-realistic, limited color palate that Garland does so well in other Jonathan Hickman comics such as Secret and The Dying and the Dead, but he's a versatile colorist and he's doing something very different here. The color choices here are pretty muted, as fits with the grounded, relatively real world setting. Garland makes a lot of effective use of light and shadow, which helps convey the ominous nature of the events of the story. 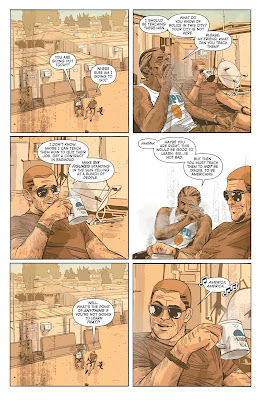 He also does a little bit of pixellation and worn, scratchy effects in several panels, which reminds the reader that the whole issue is presented as a secret dossier and we are privy to knowledge about highly confidential events. It's great, specific work that really adds to the storytelling. 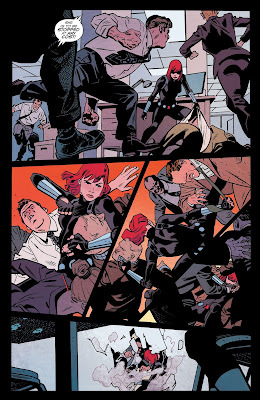 Black Widow - Chris Samnee & Matt Wilson - Illustrator Chris Samnee (who's also co-writing the book) and colorist Matt Wilson are doing stellar work on Black Widow, a terrific series written by Mark Waid. Coming off of a very successful run on Daredevil, the team isn't just repeating their work. 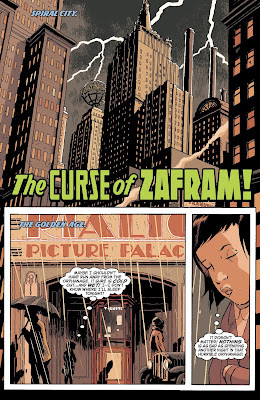 Samnee continues his wonderfully classic, expressive style but has amped up the action and changed his style somewhat to reflect the darker, moodier tone. He still does some of the very best sequential artin the business; his action sequences are a master class in visual storytelling. And Wilson continues to be one of the most versatile colorists in comics. 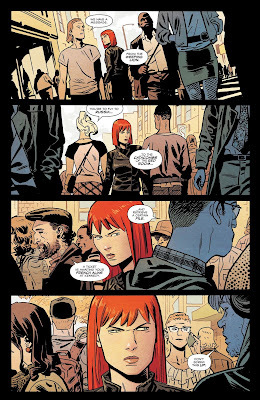 In Black Widow he brings a somewhat flat, muted style that gives this book an old-school feel, and adds a slightly level of graininess that lends itself to the haziness in any good espionage story. It's great work all around. 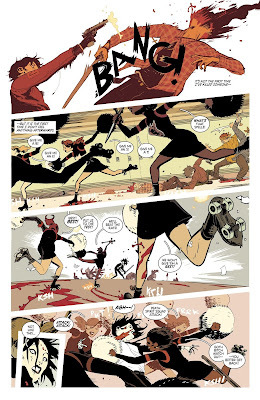 Deadly Class - Wes Craig & Jordan Boyd - Wes Craig continues to do some of the most dynamic, visceral, insane comic art out there, in the pages of Deadly Class. If you need hyper-kinetic chases, coupled with violence and gore, Craig is your guy. If you also want incredible visual humor and exaggerated characters that still *feel* real, he's also your guy. Now when Lee Loughridge left Deadly Class as colorist, I was concerned as this was a high bar to fill. However, I needn't have been concerned as Jordan Boyd has stepped in and very much lived up to the high standard set by Loughridge. 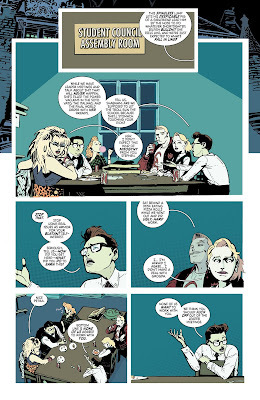 Boyd's colors bring so much style and atmosphere to the page, they're at turns grim and vibrant and just frenetic; Craig and Boyd combine to make the Deadly Class visual experience a unique one. Dept. 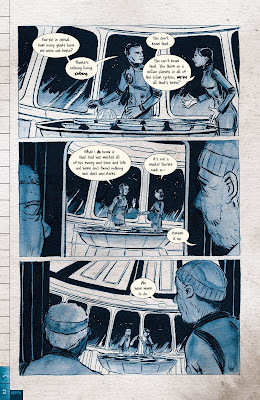 H - Matt and Sharlene Kindt - Matt Kindt is doing some of the best, most interesting work I've seen from him in the pages of Dept. H (and I say this as someone who loved his work and for whom Mind MGMT has quickly become an all-time favorite). Mind MGMT was weird and trippy and world-spanning; by contrast, Dept. H is intentionally close and claustrophobic. This is achieved in the detailed, cramped setting in which the story mostly takes places. 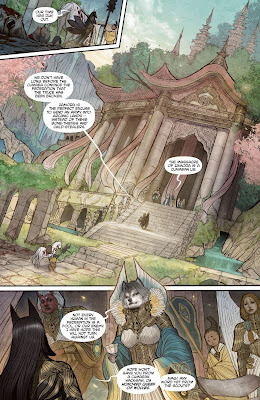 It's also achieved by the incredible color work that Sharlene Kindt is doing on the book. As depicted above, she really uses incredible blue color work to convey the sense that the characters trapped at the bottom of the ocean really have an entire world of water pushing them down, ready to break through the thin walls of their undersea station. Sharlene's gorgeous, vivid, colors also highlight the fundamentally alien nature of some of the geography and plant and animal life at the bottom of the ocean. She also does strong work in bringing a faded, more muted tone to the flashbacks to the past. It's gorgeous, haunting work. 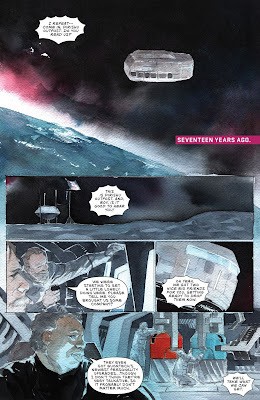 Descender - Dustin Nguyen - Descender is one of the most hauntingly beautiful and sad comics you'll read. 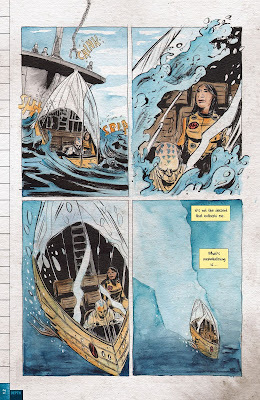 It's very emotionally affecting and that comes from a great story written by Jeff Lemire, but it also really comes from Dustin Nguyen's gorgeous watercolor illustration. It's such an interesting choice as it's not what you might expect for a futuristic science fiction epic involving aliens and robots, but it gives the book a more beautiful, dreamlike quality. You can typically see the texture lines of the pages on which Nguyen is illustrating, so in some ways you never forget you;re reading a comic, but Nguyen still brings you in. He uses a lot of white space and minimalist illustration, which is effective in creating the weird, almost abstract world of the robots. 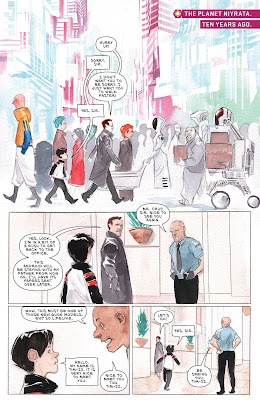 In a recent issue of Descender, there was close to 10 consecutive pages of silent comic and Nguyen depicted three different sets of characters interacting and it was all beautiful and intimate and tense and tragic; it's wonderful work. 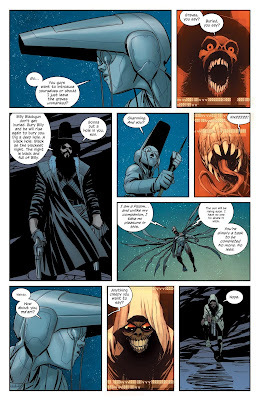 East of West - Nick Dragotta & Frank Martin - East of West has consistently been one of my favorite books for the past few years, and a huge part of it is the art team of Nick Dragotta illustrating, and Frank Martin coloring. Seriously, just look at those two sample ages above. Dragotta creates some of the insane, weird imagery in a comic full of insane, weird, scary imagery, and he completely sells these characters. He has consistently great and innovative character design, along with great, detailed background. Dragotta is a master at really creating a sense of space and geography in a comic. Few people convey motion in a comic better than Dragotta does, but when you see someone on a speeder flying by, Dragotta makes you believe it. He consistently makes interesting layout choices, and his flipping from character to character, or zooming in for a closeup, make him the best possible choice to draw a comic full of tense standoffs. His partner, Frank Martin, is one of the best kept secrets in comics. He does absolutely stunning work coloring every single issue of East of West. His colors convey a broad set of emotions, they set an atmosphere, and are an absolutely integral part of the storytelling in East of West. 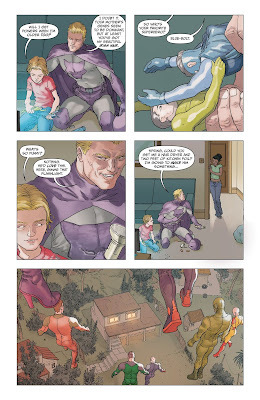 Jupiter's Legacy 2 - Frank Quitely & Sunny Gho - Frank Quitely is a master at superhero comics (which you probably already know), and his skills are on great display in Jupiter's Legacy 2. 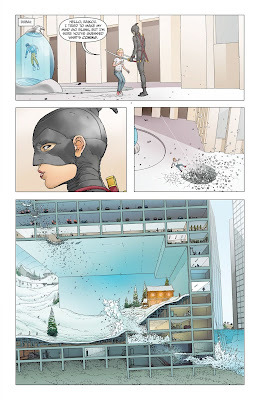 There's so much that Quitely does well, but the two things I want to highlight are the sense of physical motion and impact. In the panel on the left, you can see a character taking off into the air. You don't actually see her, but you see the hole in the ground and another character flying in her wake, and then you see the impact of that character flying through a building. You don't even see that character but you see her impact, and from that you can sense both her speed and power. That's terrific work. The other point I want to highlight about Quitely's work is his fun, expressive facial acting and body language. His characters don't necessarily have a traditional beauty to them, but they have an incredible charm in their own way, and he has a great sense for precise facial acting and body language, as shown by the panel on the right, with the father tentatively interacting with the son. Their eyes really do a lot of storytelling. Jupiter's Legacy 2 continues to be a very fun read, and Quitely's excellent work is great reason to take a look. I'm also happy with the color work being done by Sunny Gho on this book. It's subtle, restrained work, and it doesn't overpower the art. I think Gho does strong work in capturing mood and atmosphere in the pages of Jupiter's Legacy 2. Lazarus - Michael Lark - Lazarus is one of the most consistently interesting, intelligent, well-thought comics available, and if all of that doesn't convince you, there's the absolute top-of-his-game illustration being done by Michael Lark. Lark has incredible mastery of the form, and does terrific, grounded, realistic illustration, but what I want to highlight here are his staggering work in depicting action and brutality. If you need an artist for a comic about combat or warfare or a chase sequence and you want it done with the highest degree of verisimilitude? Lark is the artist to call. 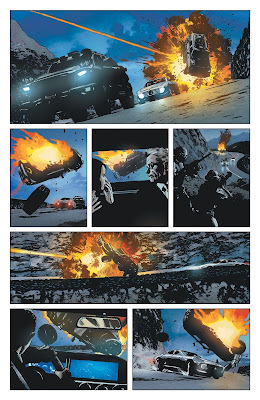 His depiction of a car chase-attack sequence is vivid and you can also follow the sequential action clearly (something that's sadly not always the case in comics). 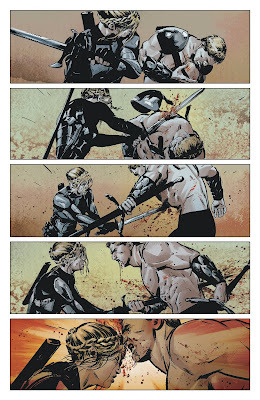 There are few better at depicting hand-to-hand combat; the sequence above (again) works perfectly from a sequential perspective, and also conveys the vicious brutality of close combat. Lazarus is a spectacular book, and Lark is doing terrific work every issue. 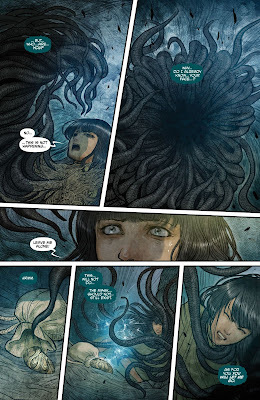 Monstress - Sana Takeda - I enjoy Monstress; it's a dense and interesting, fully-realized fantasy world, and writer Marjorie Liu is doing strong work. However, even if I didn't love the book I would still look in admiration and amazement at the spectacular work that Sana Takeda is doing on illustration. Like the book generally, the art is lush and detailed and fully realized. Even in issue 1 it feels like you're picking up a comic about an existing world. I picked 2 examples of illustration to show what Takeda is doing do well. On the left you can see a lushly illustrated, staggeringly beautiful page, fully of detailed background and gorgeous, weird characters. On the right you can see terrifying horror (and this really is a fantasy-horror book, make no mistake), as Takeda brings to life some truly terrifying imagery. Takeda is really doing virtuoso work on this book. 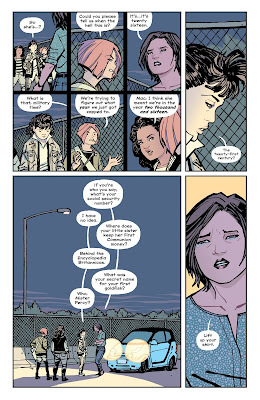 Paper Girls - Cliff Chiang & Matt Wilson - Brian K. Vaughan's great independent comics are inextricably linked to certain artists. It's hard to imagine anyone other than Fiona Staples on Saga, just like Tony Harris really made Ex Machina come to life. 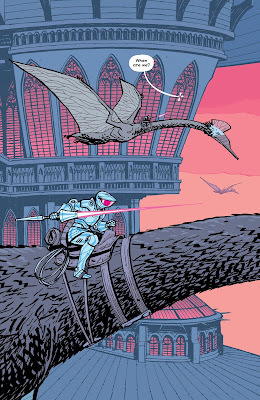 Similarly, I wouldn't want anyone on Paper Girls other than Cliff Chiang (on art) and Matt Wilson (on colors). Chiang has asuch a delightful, specific, approachable art style in this comic, and he puts such great care into character design and detail. Even more specifically, he does an amazing job capturing the very specific style of late 1980's-style of clothing. Chiang is also a master of setting a great pace and depicting both action-packed and small moments. Chiang has a perfect partner in Matt Wilson, who brings such a great, distinctive color style to the comic. Wilson's colors are much more atmospheric than realistic, but they help set scenes perfectly, either (as in the scene on the left) depicting a relatively mundane conversation (albeit one between a kid and her future self), or showing a surreal science fiction scene. Wilson makes each scene pop with energy amd his choices in colors always feel spot on. 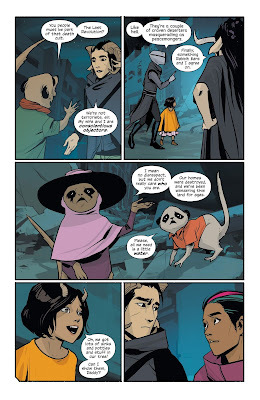 Saga - Fiona Staples - Speaking of great artists working with Brian K. Vaughan, even though at this point it's a pretty long-standing book (by modern standards) I would hate for the work Fiona Staples does on Saga to get lost in the shuffle. I've been engaged more by certain story arcs and less by others, but my enthusiasm for Staples' art has never waned. She continues to produce, on a regular basis, some of the finest art in any comic. Her absolute mastery of emotion and expression is something to behold (just look at the raccoon-type people on the right-hand panel above), and she makes every character seem interesting and important and alive. As absurd as characters can be (such as robots that have televisions as heads, or some of the even more absurd or disgusting characters she's depicted), Staples' art makes you take them seriously. She also has a great, varied color palate in illustrating her work, and along with great skill and care in depicting backgrounds and locations, she makes the world of Saga one that feels truly real. Seven to Eternity - Jerome Opeña & Matt Hollingsworth - Seven to Eternity is a great book so far, and it has some of the best, most intricate, detailed work I've seen from Jerome Opeña. He's created a unique, genuinely interesting-looking fantasy world which combines together elements of lush greenery, the western plains, and fantastical alien cities. As you might expect from a skilled artist such as Opeña, this is a story of both big action and small emotional moments and he excels at both. 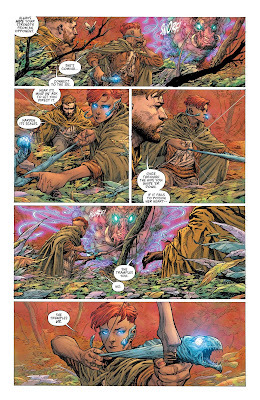 Opeña has an excellent artistic collaborator in Matt Hollingsworth on colors. There are some genuinely stunning color effects in this comic book, from the eerie, luminescent glow of fairy-type creatures, to the frightening, almost overpowering light of a burning blaze, to the Kirby-esque crackle of magic effects, to the fading glory of a gigantic red sunset – Hollingsworth's detail and bright colors help bring this fantastical world to life. A great-looking fantasy world. The Sheriff of Babylon - Mitch Gerads - I first became familiar with Mitch Gerads' artwork on the Punisher series he was doing a few years ago. Punisher isn't my favorite character, but I loved Gerads' artwork and it seemed to me at the time like it would be a perfect fit for an action/war type comic. So I was thrilled when I learned that Gerads would be the artist on The Sheriff of Babylon, written by the prolific and terrific Tom King. The Sheriff of Babylon takes place in the early days of the Iraq War and drays on King's time in Iraq as a CIA employee, and the book feels like it has an extremely high level of verisimilitude. 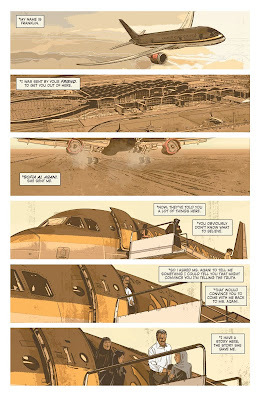 This is a non-superhero, non-magical book, set in a real place at a very specific moment in time, and in order to sell a comic like that, you need someone who's willing to be detail-oriented and specific and careful, and all of that comes across in Gerads' artwork. I want to be clear that art is terrific more generally, as all of the character designs feel specific and real, Gerads does great work on both more personal, difficult moments, along with subtly incorporating moments of levity and visual humor. His depiction of background and setting are first-rate, and his color work is appropriately brown and sandy and conveys the middle-eastern location perfectly. It's great, specific work. Silver Surfer - Mike and Laura Allred - No one's art makes me smile like the art of Mike and Laura Allred. There's just so much joy and life and energy and enthusiasm for the medium in every one of their panels in the pages of Silver Surfer. 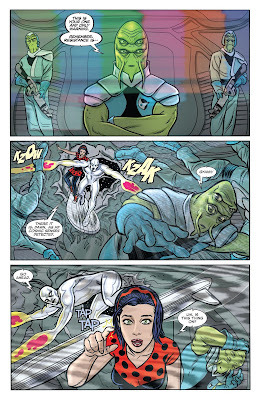 Mike Allred is a gorgeous illustrator, and he excels at the weird, coming up with more and more creative aliens and other characters in every issue of Silver Surfer. But what really makes the art go "pop" is the colors from Laura Allred; they're old school silver-age pop-art colors, and they're a delight to look at every time. Just to be clear, Mike is a first rate sequential illustrator, and his art tells a clean, clear story even in the midst of the plot craziness. One of my favorite issues of recent years though, was an issue of Silver Surfer that was a giant Moebius strip. It was an amazing feat of comics skill, and just another example of the great work done by the amazing Allreds. They bring a Kirbyesque charm to the pages of Marvel comics. 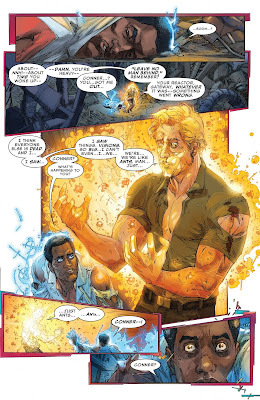 The Ultimates - Kenneth Rocafort & Dan Brown - The Ultimates was one of my nice surprises of the past few years. 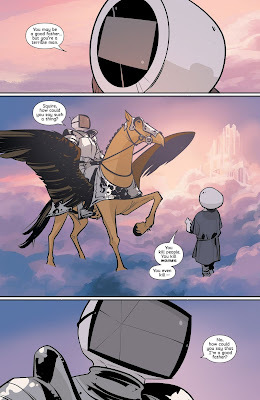 After the end of Secret Wars, Jonathan Hickman went away from doing Marvel Comics work, and so there was a void in my life for big, weird, scifi superhero storytelling. While I've enjoyed some stories (the encounters with Galactus, Eternity and the Molecule Man) more than others (anything relating to Civil War II), my enthusiasm has never wavered for the terrific art from Kenneth Rocafort with colors from Dan Brown. I wasn't that familiar with Rocafort's artwork but knew him as someone who drew for DC in something of what seemed to me like the DC-house style. But that completely undersold the terrific amount of talent he brought to The Ultimates. 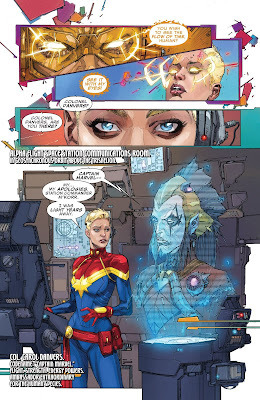 The pages of the Ultimates are full of all sorts of weirdness; not just science fiction weirdness, but meta-story weirdness where the very nature of comics continuity is explained in-story. Rocafort took on all of that and showed exceptional skill in bringing this group of superhero explorers to life. He had a great partner in Dan Brown on colors, who really brought vibrant, interesting and weird colors to the forefront in helping establish this book as the place to go for big, scifi superhero madness. 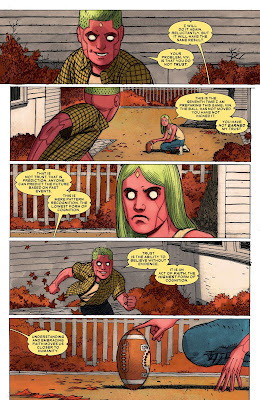 The Vision - Gabriel Hernandez Walta & Jordie Bellaire - The Vision is one of the best comics in years, and worthy of all of the praise it gets. It's a book that I think will only grow in reputation and influence over time. Tom King was fortunate to have artistic partners as great as Gabriel Hernandez Walta and Jordie Bellaire. They really brought this book to life, and created the very specific mood of the story. That mood is profound existential dread and uneasiness, and King's weird narration coupled with the uncanny-valley faces of the androids, make for an incredible, unsettling read. Given the more limited palate of facial expressions an android can make, Walta does some incredible facial acting; in both of the panels above you can see the humanity in both the Vision and his children. Bellaire, too, helped to create this weird domestic existential tragedy of a story, with a varied, subtle color palate. Colors were jarring when they needed to be, and otherwise, just blended seamlessly into the art. 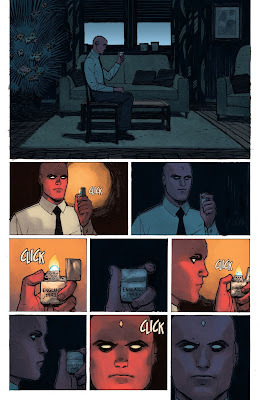 In the above right panel, Walta and Bellaire do remarkable emotional work on a wordless page where the Vision contemplates a tragedy, and with only subtle eyebrow shifts and changes in shadow, show the Vision processing grief and turning to anger. It's exceptional work, and Walta and Bellaire really make this book.